The cake is made from 20cm round sponge layers. Two layers vanilla and one of chocolate. These were sandwiched together with vanilla buttercream and there is a surprise in the middle layer which is chocolate ganache. The whole cake was covered in fondant. 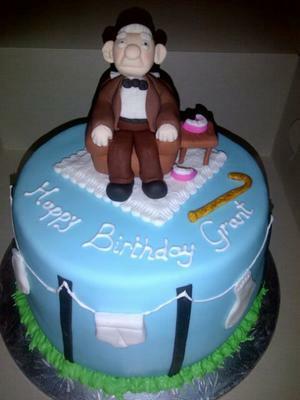 The old man on the top of the cake is made from fondant which I treated with CMC powder. I've used spaghetti inside the man to give him a good foundation. I started by making the chair. I then added the legs and shoes. Once this was in place I added his body which I decorated with a shirt. I then added his arms and his cardigan. I then sculpted his face and added features like his hair and eyebrows. The bags under his eyes are to make him look older. I finished him off with big ears and gave him a belt and a bow tie. The table is also made from MCM treated fondant and I used spaghetti for inside the legs and made the table look like wood with a line tool. I then made the false teeth with pink and white fondant. The old man sits in his chair on top of the white rug which is textured with a silicone mat. The cake was finished off with piped grass edging, washing lines which was piped on with royal icing and I stuck fondant undies and socks on the line with the royal icing.